When we were in the process of planning our kitchen renovation, we struggled with what we wanted to do with this corner. 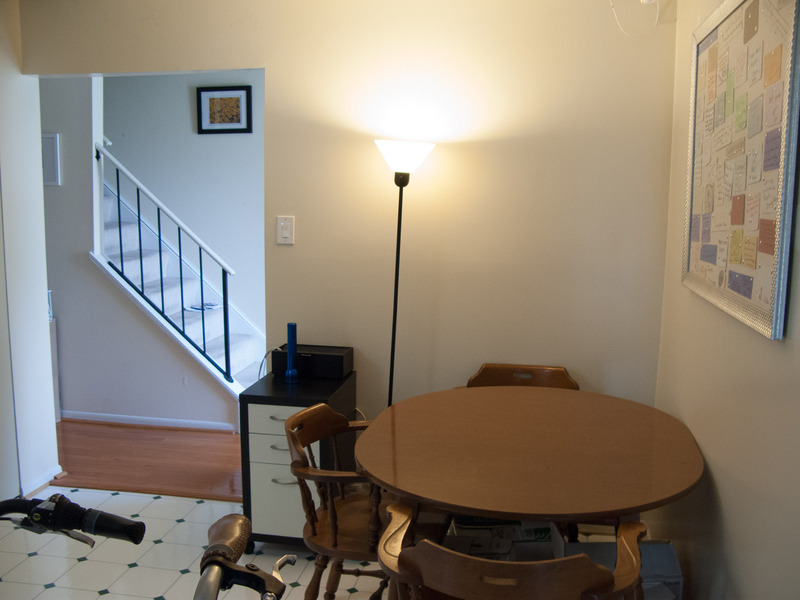 Presumably, it should be an eat-in area, but we had a nice dining setup in our living room area. We tinkered with a few ideas for the corner, including a desk area, some sort of high countertop bar seating, and a banquette. But we were being very indecisive. So we decided to just renovate the main “galley” area of our kitchen and then we could always revisit the nook in the future. About nine months after the kitchen renovation concluded, we decided that a banquette would really be ideal for a couple of reasons. Now that our kitchen wasn’t a poorly lit and terribly depressing space, we wanted to eat in the kitchen! 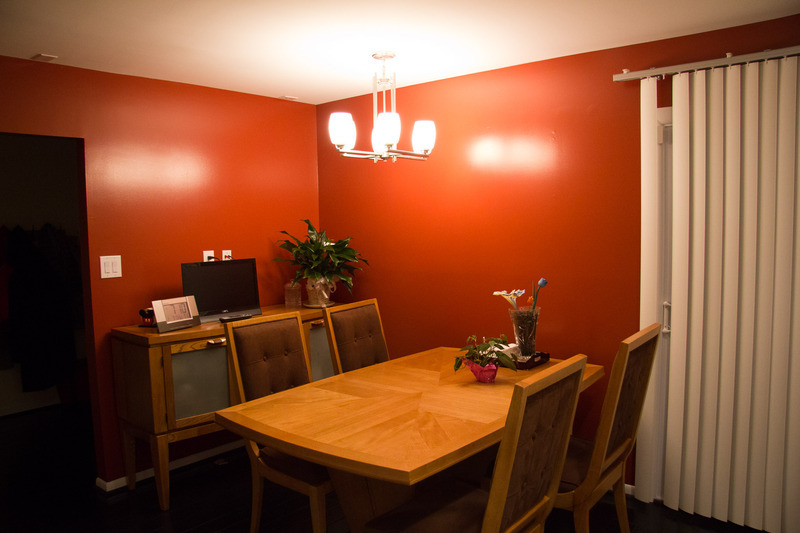 We had moved our dining furniture into that nook right after the renovation was done. We enjoyed eating in there and quickly took advantage of the reclaimed space in our living room by installing some floor to ceiling bookshelves that have a lovely built-in look. However, our dining furniture was not working out in the new kitchen, aesthetically and functionally. It took up too much space, and the buffet, which I loved having when it was in the living room suddenly no longer worked. We’d have to move the table to access anything in the buffet, and we weren’t able to access one side of it at all because it was butted up against the wall. We realized that a banquette would really maximize space. We could easily seat six people on the L-shaped banquette benches, plus three chairs on the other side. Seating nine people any other way in that space, such as through the use of chairs alone, would be very impractical. Although we had plenty of kitchen storage now thanks to our renovation, we could create even more storage by having the banquette seating double as low cabinets. We are not uber-DIY people, but we can hold our own on some things. We are more “Let’s hire a contractor who knows what he’s doing!” type of people than we are, “Hey, let’s DIY this!” We’re typically tired on weekday evenings, and we don’t like spending multiple weekends in a row on a single project. We checked out a few tutorials and realized that building the banquette actually would probably be a bit more “DIY” than we’re used to. 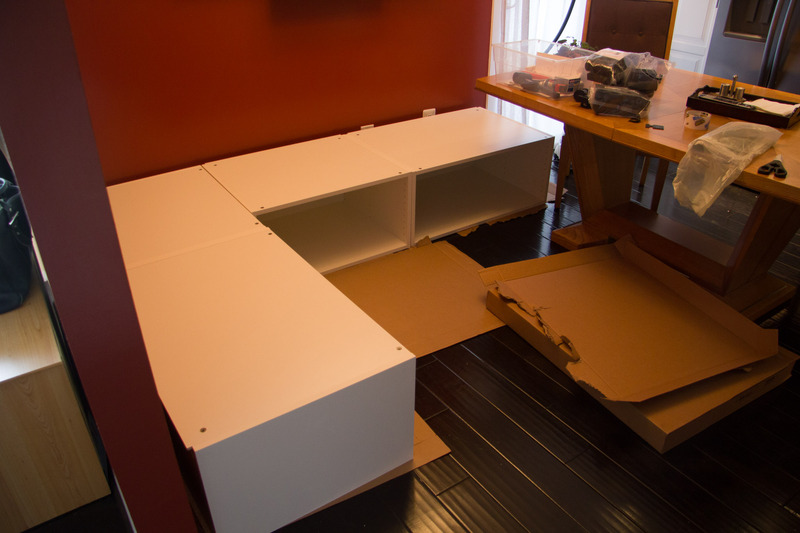 We knew we could use Ikea upper cabinets as the banquette “benches,” but there was some sort of framing required beneath the cabinets. Why? Because if the cabinets just sit on the floor, you can’t open the cabinet door. Instead, the cabinet door would hit and scrape the floor any time you wanted to open the cabinet. We didn’t know anything about building any sort of framing. But, we decided to proceed with DIY-ing it. 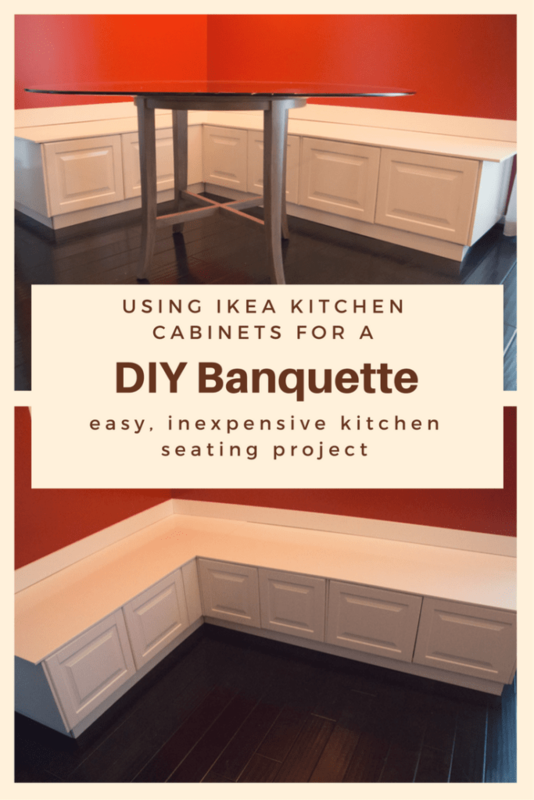 We actually had a lot of the tools that would be required and we figured if we messed it up too much, we could just hire our original Ikea contractor that installed our kitchen to finish the banquette job. All told, we spent $652 on this job, not including some various tools and screws we had to buy along the way. Looking for some ways to save money on this particular project? Head over to raise.com, a discounted gift card reseller, and buy discounted gift cards for Ikea . (Double bonus, be sure to check Mr. Rebates first to see if they’re offering any cash back on Raise.com purchases. As of the time of writing, it’s 3% cash back!) 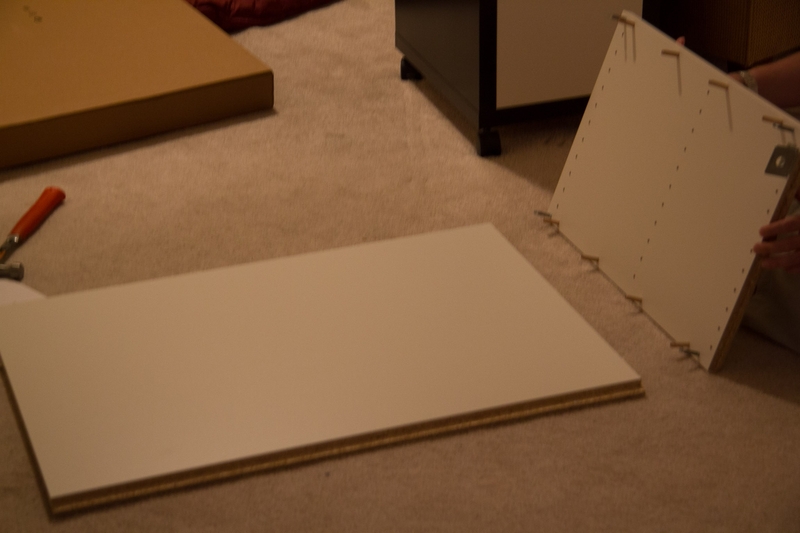 Is Raise.com all out of Ikea Gift Cards? Be sure to check GiftCards.com, GiftCardMall, or even GiftCardGranny. Buying discounted gift cards is one of my favorite ways to save money on purchases I was going to make anyway! Have you had any troublesome closet doors in your home? What solution did you come up with? This tutorial will be presented in multiple parts and we’ll talk about what worked for us (and what didn’t work) during the process. But here are some quick and dirty steps. Take measurements of your space. Drawing out your plans would be very helpful. Ikea kitchen cabinets only come in certain sizes, so you may have to accept that the benches do not fit perfecftly in your space. In our case, there’s about one inch of empty space along one wall, and about three inches on the other wall. That combination of cabinets would best fit the L-shaped bench we wanted to build in our kitchen. Pick out a door style. Ikea has TONS of door styles. We weren’t sure what style we wanted, so on our first shopping trip for the banquette, we purchased three different styles, with the intention of returning the ones we didn’t like. We purchased Lidingo (which would match our existing Ikea kitchen cabinet doors), the Harlig, and the Abstrakt. Ultimately we decided on the Lidingo. Some pieces of 2“x3” wood at Home Depot / Lowes, or other home improvement store. This will be used for the frame of the banquette. We tinkered with these dimensions SO much. 2“x4” wood made the bench too high for normal height people to sit on. 1“x3” wood wasn’t quite even enough. So the 2“x3” wood worked perfectly. Some pieces of 2“x4” wood to build some extra supports inside the cabinets. 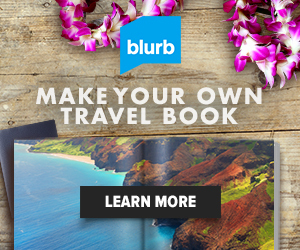 This is optional, but highly recommended. Since these cabinets aren’t necessarily meant to be sat on, we added some support in the middle of the cabinets to prevent any bowing. Everything else can be purchased as you go along. But these are the things you’ll need to get started. We’ll talk about our other tools and parts we used as the tutorial progresses. I would like to point out that Ikea has a very generous return and exchange policy. So, if you’re not sure about something, buy it and you can always return it later. They even take back damaged items (even when it was due to our own carelessness). So, don’t be too scared to take on this project. After buying those pieces, take a day to rest. Have a beer. Or several. Those Ikea kitchen parts are REALLY heavy when you’re carrying them from your car into the house. 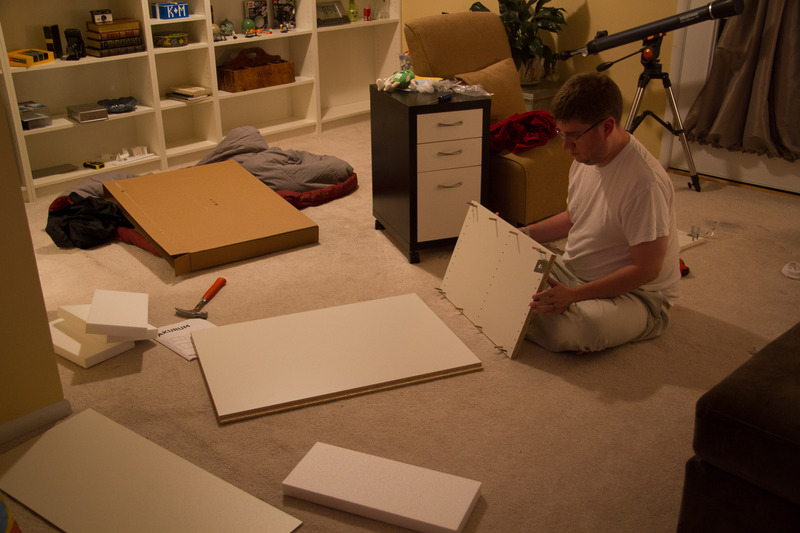 Then, when you’re ready to make a mess in your living room, assemble the cabinets according to the instructions. Then, temporarily place them in your desired spot to confirm that the dimensions work in the space. We’ll talk more about building the “frame” for the cabinets in our next tutorial. Then, take a step back, admire your work, and take another break. Because, let’s face it, carrying those assembled cabinets from your living room to your kitchen was not only heavy, it was very awkward to carry them! 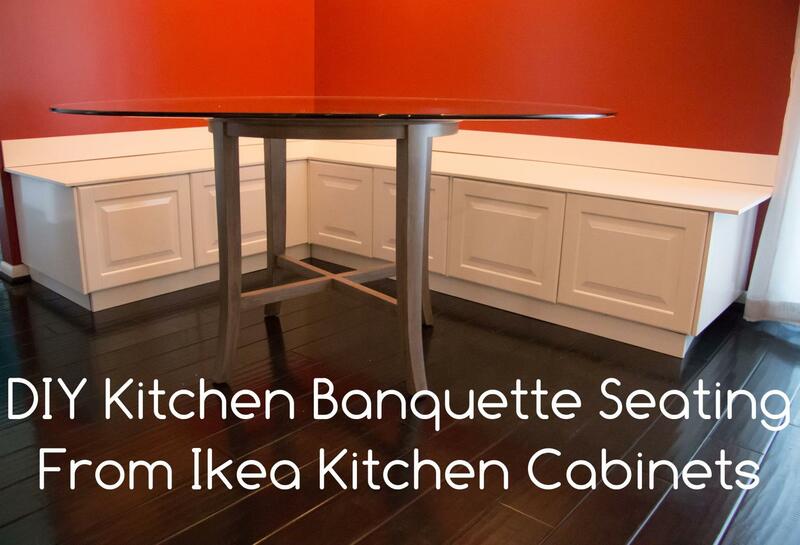 Next, it might be a good time to consider the tools that you’ll need to build a banquette. You’ll see the tools we used in the next few posts in the series, but here are some of the basics that we needed. (Some of these we already owned, so we didn’t buy all of them especially for this project or anything!). Some of these things were cheaper and easier to buy online (like the tools), while others were significantly easier and cheaper to buy from our local Home Depot. 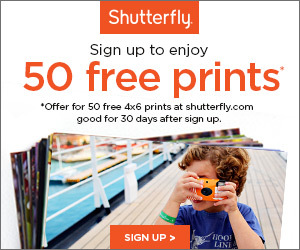 (You can always order them online in advance to the store, saving you time and hassle). Also, you’ll need miscellaneous screws and stuff, as well as a few screwdrivers, but any basic set will do you just fine. A little electric screwdriver could also save you a lot of time. A drill with some screwdriver bits could also do this same work, but sometimes the drill gets heavy and clunky after a while. Is Raise.com all out of Ikea Gift Cards? Be sure to check GiftCards.com, GiftCardMall, or even GiftCardGranny. Buying discounted gift cards is one of my favorite ways to save money on purchases I was going to make anyway! 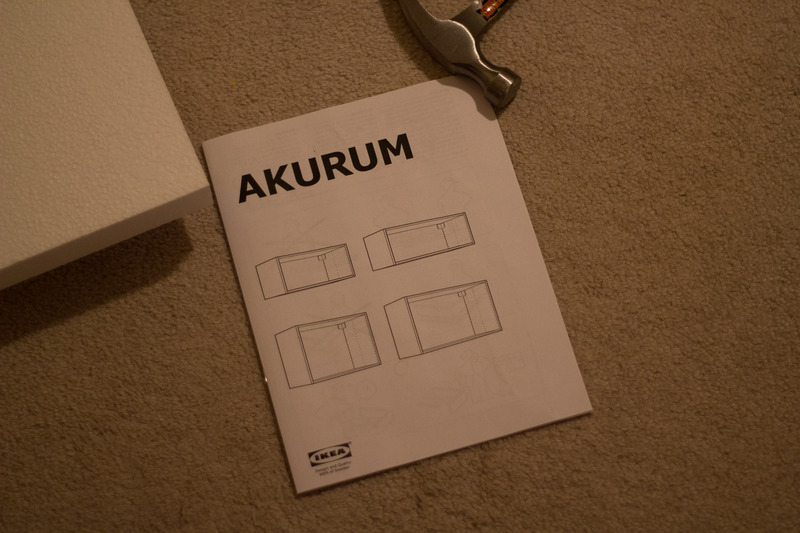 And, don’t just limit your search to Ikea. You’ll probably need some Home Depot or Lowe’s gift cards too. It’s so generous of you to take all that time, pictures and write all those détails. Thank you for doing it. We’ll be following your instructions step by step (whenever we decide to start) and cross our fingers. Thank you so much for sharing! I’ve been wanting to do this in my kitchen, but wasn’t sure if cabinets would be sturdy enough to hold the weight of people over time. After using it for these many months, are you still pleased?